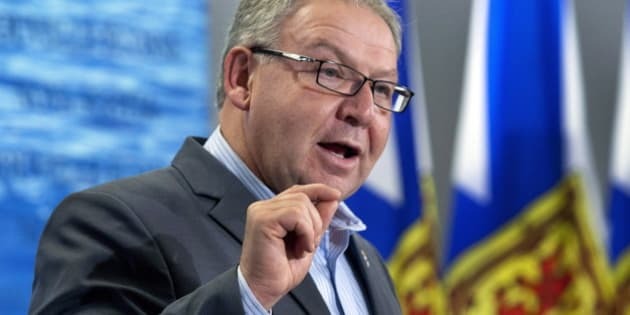 HALIFAX - Nova Scotia NDP Premier Darrell Dexter stepped up his criticism Saturday of the Liberal plan for health care in the final days of the provincial election, saying he has heard from voters it is their main concern before they cast ballots Tuesday. Dexter said people in rural areas are angry that the Liberals are promising to cut the number of health boards from 10 to two because they fear it will jeopardize their access to care. "I was up in Cumberland County and people are hopping mad about this," he said while campaigning in Halifax. "They see this as nothing more than an attempt by the Liberals to take things back to where they were in the 1990s, which was disastrous for Cumberland County." Dexter said other provinces such as New Brunswick and Alberta have tried to restructure their health systems in a similar way but that resulted in higher administrative costs. "Alberta is a really good example, as a matter of fact, where you've not only seen no savings, but you've also seen a tremendous amount of chaos in that system," he said. Dexter levelled the broadside as he was knocking on doors with the NDP candidate for Dartmouth South, a riding previously held by one of his cabinet ministers who is not running again. His focus on health care builds upon a message he delivered earlier this week, when he said health was the fundamental issue of the campaign. The Liberals say their promise to cut the number of health boards would save $13 million that they would put back into patient care. Liberal Leader Stephen McNeil said he's hearing a different message from people in rural areas about their plan for health care. "They want the government to spend money to ensure that they have doctors, nurses and that their hospitals are open," said McNeil between campaign stops in Antigonish and New Glasgow. "Mr. Dexter is more content on spending money on administration. We believe we should be investing that money in frontline health care." McNeil did not specifically respond to Dexter's assertions that reducing the number of health boards in Alberta and New Brunswick led to higher administrative costs in those provinces. But he said he was confident his plan for health would make Nova Scotia's health care system more efficient. McNeil said Friday he was planning to visit 46 of the province's 51 ridings before Tuesday's vote, and on Saturday he had nearly a dozen stops planned from Cape Breton to the central Nova Scotia town of Truro. Progressive Conservative Leader Jamie Baillie hit the hustings Saturday in Springhill in the riding of Cumberland South, where he was elected in an October 2010 byelection, before he toured NDP-held ridings in northern and central Nova Scotia. Just after attending a barbecue with federal Justice Minister Peter MacKay and country music singer George Canyon in New Glasgow, Baillie reiterated that he wanted to convince voters the Tories are a better option than the Liberals. "For those Nova Scotians who want real change, I want them to know they have the PC party to turn to, and if they're looking for more of the same, the Liberals are nothing more than a darker shade of orange," said Baillie, repeating a sound bite he delivered at a news conference in Halifax on Friday. At dissolution, the NDP held 31 seats in the legislature, followed by the Liberals at 12 and the Progressive Conservatives with seven. There were also two vacancies.